Why Do We Monitor Water Quality? 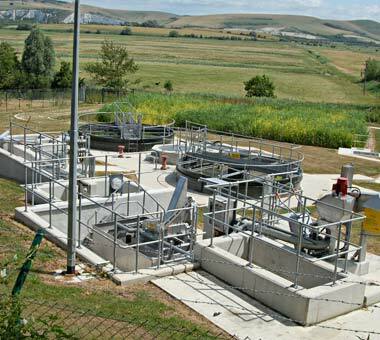 38 major sewage treatment works are located on the Sussex Ouse and its tributaries. Risk of pollution, not from harmful bacteria or solid waste, but from dissolved nitrates, phosphates and other harmful chemicals, high levels of which can lead to the destruction of the rivers rich variety of wildlife. Increasing population in the South East increases the demand to put more treated or partially treated waste into the rivers. Effects are exacerbated in summer when there is less water to dilute the waste. In times of heavy rain sewage treatment works can’t always cope and sometimes overflow, depositing raw sewage into the rivers. Some farmland along the rivers is ploughed to the banks, allowing fertilisers to easily ‘run-off’ into the water, making the situation worse. OART (formally SOCS) have been taking water samples regularly from the Bevern, Plumpton Mill & Northend Streams since May 2001. Some of the original sites showed no significant failure of water quality and have been substituted for other sites, although the original data has been retained. More recently, further sites on the rivers Ouse & Uck along with many of their tributaries have been included. All these new sites are on the section of the river Ouse which has been designated as a salmonid water under the EU Freshwater Fisheries Directive. 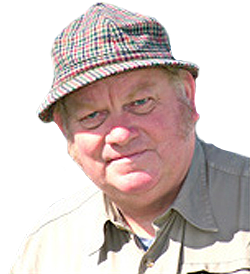 Where and when necessary provide evidence of quality falling short of standards laid down by the EC Freshwater Fish Directive, for both salmonid and cyprinid (coarse) fish. Help to identify isolated pollution incidents and all our information is passed to the Environment Agency for investigation. A minimum of 12 (monthly) water samples are collected in clean glass bottles (to avoid cross contamination) from each site and taken back to our ‘in house’ (literally) laboratory! At least 12 samples are collected in order that a true picture of the quality can be ascertained with information from each site calculated as an average. Where untoward results are obtained, the period of testing is extended to provide further evidence of a problem. 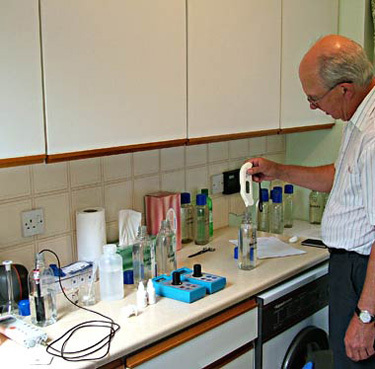 Tests are carried out using standard scientific test equipment (ion specific meters) designed to measure concentrations of ammonia (usually from sewage effluents), phosphate (from sewage and, to a lesser extent, agricultural fertilisers) and dissolved oxygen. Since 2007 we have also measured the amount of nitrogen derived from the nitrates in our samples. These are also present in sewage effluents & agricultural fertiliser and their presence, in significant amounts, causes eutrophication along with potential health risks from their presence in drinking water. Although the EU Freshwater Fisheries Directive does not set parameters for nitrates but for nitrites (NO2) it gives guide values as shown in the table below. Recently we have added measurements of conductivity and pH to our testing regime. Conductivity measures the total ionic concentration in the sample, so includes salts such as sulphates, chlorides etc. and pH is a measurement of acidity or alkalinity of the water.